Robert Woodhead Ltd was in the spotlight at last night’s Lincolnshire Construction and Property Awards 2017, taking home the title of Heritage Project of the Year! 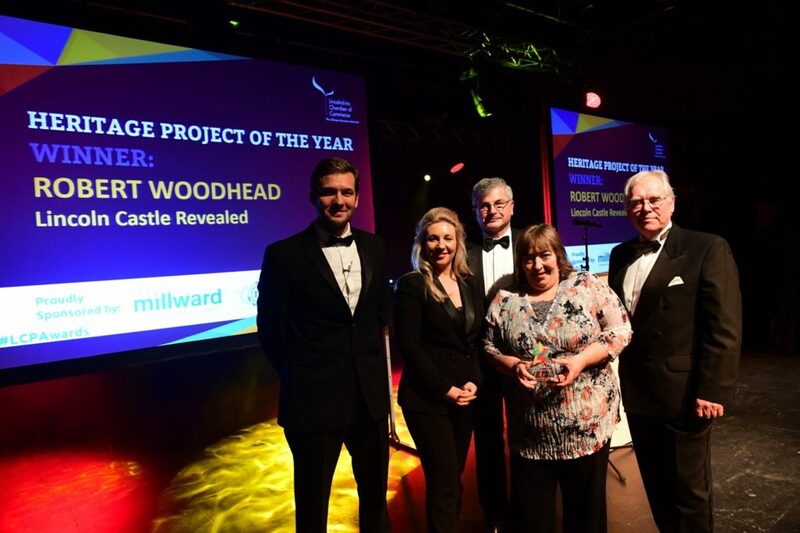 The Heritage Project of the Year Award was handed to Woodhead Heritage for its work to restore Lincoln Castle. The Woodhead Heritage team was nominated for its delivery of the £19.1m Lincoln Castle Revealed project, which has seen the historical city’s Castle and its walls restored, as well as creating a dedicated vault and visitor experience for Magna Carta, completed ready for the 800th Anniversary of Magna Carta. Not without its challenges, the project unearthed a late Saxon Sarcophagus, which was successfully excavated in the middle of works. Woodhead and Lincolnshire County Council also worked alongside Natural England to find somewhere to accommodate a rare breed of bat, which had been nesting within the Castle walls. Opened by Princess Anne in 2015, the historical attraction saw visitor numbers soar following its restoration. Juliet Slater, Team Leader for Woodhead’s dedicated Lincoln team, said: “We’re delighted to be a part of the first year of these awards and to walk away winners in the Heritage category. Woodhead’s work to enable the delivery of a public sector hub for Lincoln was also praised with two ‘Highly Commended’ certificates from the judges. The project to bring the City of Lincoln Council’s services and Lincolnshire Credit Union under the same roof as the DWP’s Jobcentre Plus, was the biggest national relocation ever for the DWP which was procured through the EMPA Minor Works Framework.